Astrophotographer Miguel Claro took the images as a well as a timelapse video from Juromenha, Dark Sky Alqueva RAstrophotographer Miguel Claro took the images from Juromenha, Dark Sky Alqueva Reserve, Portugal on Jan. 11, 2015. This stunning image captures the glowing green head of Comet Lovejoy. Astrophotographer Miguel Claro took the image as a well as a timelapse video from Juromenha, Dark Sky Alqueva Reserve, Portugal on Jan. 11, 2015. 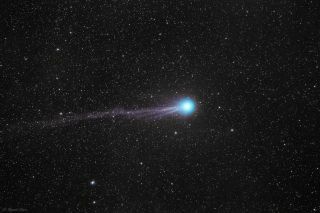 The newly discovered comet, officially known as Comet Lovejoy C/2014 Q2, was first spotted by Australian amateur astronomer Terry Lovejoy last August. The apparent green color of the comet likely comes from cyanogen, a poisonous gas that glows green when sunlight hits it. The comet was visible through much of January, but it reached its brightest early this year with a magnitude of 4.6. On this scale, smaller numbers represent brightness of objects in space. The dimmest objects visible to the human eye are about magnitude 6.5.